When I was contacted by Dr. Frank Abernathy about his invention which is supposed to reduce the fat out of regular ground beef making home made hamburgers healthier I was a little skeptical about how it worked and decided I had to see it myself. I stopped purchasing ground beef because not only is it full of fat but it also contains harmful nitrites and other things that are added during processing. When I make burgers I either use ground turkey or tofu veggie burgers. I recall that ground beef is a lot less expensive so I decided to give the Burger Buddy a try. The Burger Buddy is a simple tool made out of plastic and is dishwasher safe. The instructions are easy to read and just as simple as the tool itself. 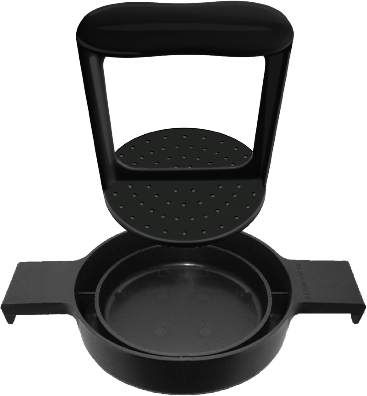 After you cook your burgers you are supposed to place the Burger Buddy on top of a pot with a little bit of water, like shown. You also have to have some water available for the burgers. 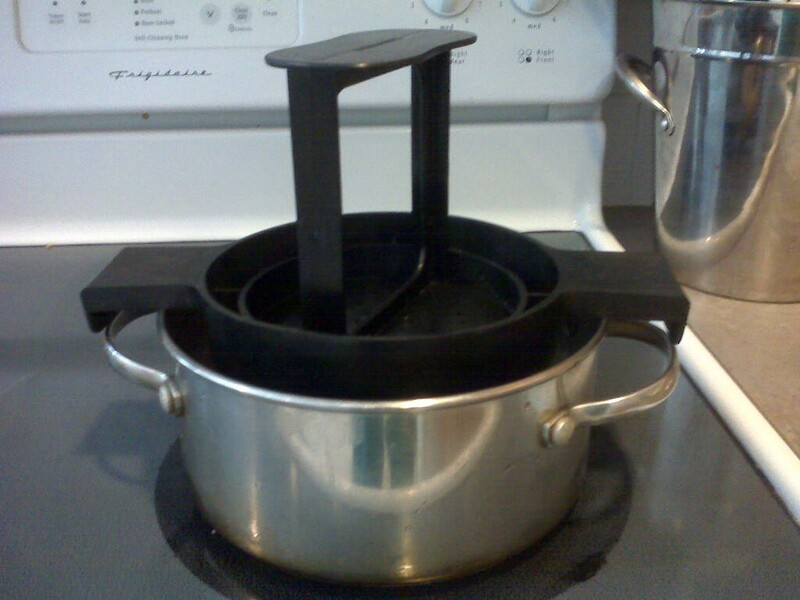 Then you place your burger on top of the pan and pour hot water over it. Using the presser you squeeze most of the fat out of the burger. This is a neat concept and it did what it was supposed to do. I have a large family and had to process 12 burgers with the Burger Buddy. After I was done and all the burgers were sitting on the plate they were cold and rather chewy. Yes they were low fat, but not like the juicy, hot turkey burgers that my family is used to. We had to microwave them before we could eat them. My family also likes melted cheese on their burgers so we had to place the cheese on them and heat them up individually in the microwave. Even after they were heated up the burgers tasted like they were leftover hamburgers. They were very dry and chewy. If you are looking for a low fat healthier alternative to hamburgers for your family, don’t waste your money on this contraption. Do what I do and serve low fat, lean turkey burgers or veggie burgers. Your family will thank you later. *Disclosure: I received a Burger Buddy from Dr. Frank Abernathy in exchange for this review. All opinions are accurate and 100% mine. 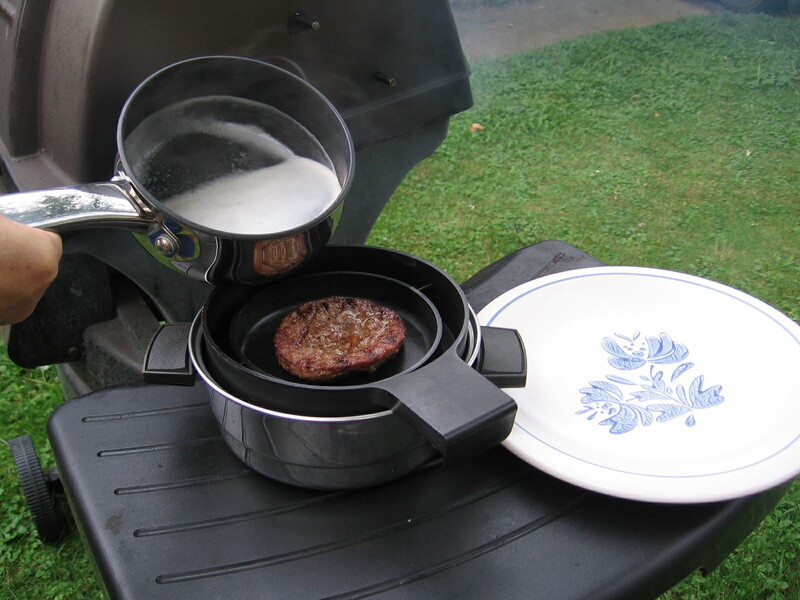 Make sure the rinse water is simmering hot and the burger is fresh off the grill. Allow the burger to breathe so it can dry off. Try sprinkling a little salt or seasoning onto the burger after treating it. If the burgers are too cold to eat you can microwave them but you need to cover them with a plate to hold in moisture. You can also add a little water to the plate. Also, do not overheat them (about 1.5 min per burger) or they will become chewy. Same thing happens to chicken. It seems like it would be a lot of work for “healthier” burger, I have two smll kids and I need quick healthy meals. Gadgets seem to slow me down, I agree with you by just switching out for ground turkey. Luckily, In my case we have a lot of great farmers in my area and every winter my Father In Law buys a whole cow (which has been grass fed and processed humanely) and splits the meat between the whole family. We're stocked for the winter and I know where and how the cow was raised : ) I hope you have a great Thanksgiving, thanks for sharing the review!! now that looks rather cool, but i think i would lose my patience after a while and just deep fat fry them all haha! It looks kind of interesting I guess. It must take time to process a lot of burgers though. Sounds like a lot of work. I will take your suggestion and get ground turkey or veggie burgers if i want to go low fat. I actually like some of the veggie burgers. http://theburgerbuddy,wordpress.com/videos. If you buy one and don't like it, you can send it back for a full refund.